Cruiseship Tycoon Game Review - Download and Play Free Version! Sail smoothly to industry dominance or get torpedoed by agitated customers as you grow a small cruise line! Humorous antics from the crew and guests. Interface can be hard to understand at first. 10 minutes until you set sail on the seven seas! This time you aren't a customer who can sit back and drink while watching those other people work. You are in control of a cruise line. You will have to decide what staff to hire, what ship to buy, what entertainment to have, where to go, and many other details to running a successful cruise line. Watch out for the rocks and the sea creatures, or your luxery trip will end up being a titanic failure! Maybe the people need a little entertainment. Build a basketball court outside and watch the people use what you built for them. Maybe grandma will throw down that monster jam! Do the people need nicer sleeping quarters? Build a master suite like no one has enjoyed before. You will have to keep your hand on the pulse of both the customers and crew to master this industry! So everyone knows what you already knew, you're a genius! Build a bigger fleet to accomodate all of the new guests. If you are going to rule the seven seas you must use all of your business accumen and have a little luck. Cruise Ship Tycoon will keep you at it until the seas are ruled by your mighty hand! If the tycoon genre has taught us anything, it’s that running a business can be hard work. So much so that even the wealthiest business magnate has to take a vacation at some point in time. 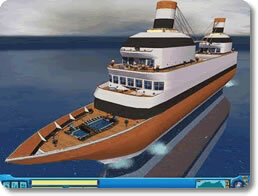 With Cruise Ship Tycoon, you won’t necessarily be going on vacation, but you will be running a popular choice for one. Despite that, however, this tycoon simulator can’t help but feel a little lackadaisical at times. At first glance, Cruise Ship Tycoon does not look like much. The graphics are colorful and everything looks as it should, but they’re still very simplistic. Nothing about the visuals is immediately eye-catching. However, looks can be deceiving, which is something you will quickly find out once you start to take control of the camera. Few games today can boast the incredible range of distance you can zoom in and out of whilst playing Cruise Ship Tycoon. You can go so far out that you’ll get a wide view of your entire ship, or so close you can count all the individual characters wandering around its hull. Speaking of characters, they hold up surprisingly well on close inspection. There’s a good variety of models, from little children to overweight tourists to seniors with walkers, and they are all animated with remarkable fluidity. A lot of fun can be had in the game just by watching people. They move around like ants, sit at tables, eat, drink, socialize and best of all, get injured. The music is pretty forgettable on the whole. It contains the typical beats of muzak you would expect to hear on a pleasure cruise or similar tourist trap. It fits the setting like a glove in that regard, though, and that’s all that anyone should expect in this kind of game. Meanwhile, the sound effects are used to much better effect. 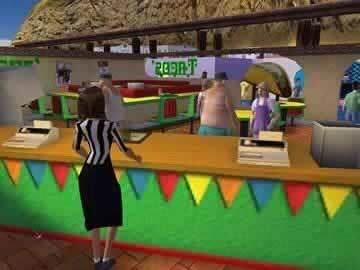 You won’t hear anything but the background music while you’re zoomed out, but as you get closer, the muzak will give way to different sounds that tend to fit whatever area the camera is focused on. For example, a nightclub will blast techno music, whereas a restroom will feature the sounds of flushing toilets and running sinks. The same goes for the characters; they’ll mumble, burp, groan, snore and make any other noise that matches up with their current activity. 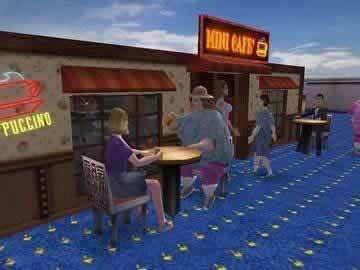 In general, it’s a really cool effect and makes the game feel a bit like The Sims. The first thing that can be said about Cruise Ship Tycoon’s gameplay is that it can seem very confusing at the beginning. You have dozens of things you can build on your ship, multiple decks to keep track of, and countless statistics to follow. It’s not very obvious how things work, and the lack of tutorials doesn’t help. A little experimentation with the menus will hopefully bring things to light, but it still would have been nice if the game had just taken a moment to show the player the ropes. One of the coolest things about Cruise Ship Tycoon is the way in which you can design the interior of your ship. You have a lot of freedom in determining what objects, services and rooms to have and where they’ll fit in on-board. You’ll need quarters so that your guests and crew can rest, restrooms where they can clean up, and medical services to treat injured personnel. Additionally, no cruise ship is complete without a healthy dose of entertainment. You can set up dozens of such facilities, including bars, restaurants, stores, health spas, swimming pools, theatres, dance clubs and more. These not only keep your paying guests happy, they also add more funds to your coffers. What services you offer is important, but what’s equally vital is how you lay them out. You might have a decent number of bars on-board, for instance, but if they’re in far off areas of the ship, it’s unlikely the guests will be able to find them. You also need to carefully consider where you place certain facilities in relation to others. The game in no way tells you what’s right and what’s wrong, which might make things seem daunting at first, but it also leaves plenty of room for experimentation. In that regard, Cruise Ship Tycoon is a fairly open game that lets you find a play style for yourself. Unfortunately, though the shipbuilding aspect of Cruise Ship Tycoon is extensive, the actual simulation portion of it is pretty simple. Ensuring that you can turn a greater profit with every voyage you make is as simple as addressing your customers’ complaints. Achieving a balance between your aggravated guests and limited funds can be an interesting struggle at first, and for the first hour or so, Cruise Ship Tycoon can be quite fun. Sadly, it doesn’t last. Once you finally figure out the tricks, it becomes ridiculously easy to make a ton of cash after one cruise. The fact is there just isn’t a lot of depth to Cruise Ship Tycoon. There may be many facilities you can add to a ship, but it doesn’t take anything to unlock them all. There are no short-term goals to meet in the main game to keep you focused on a specific task. Most of all, aside from the occasional on-board injury, there aren’t a whole lot of hazards to be on the lookout for either. Overall, it feels less like a game and more like basic routine. Perhaps the worst and most unforgiving aspect to Cruise Ship Tycoon is how poorly optimized it is as a product. On first impression, the game does not boast particularly high system requirements, implying it should run smoothly on most computers today. However, as your ship gets increasingly more crowded, the frame rate will progressively stutter more and more. After a few hours, a single save can acquire so much lag that it can be rendered unplayable. This issue can be alleviated by using a higher-end machine that exceeds the recommended specifications, but such a problem should not have been present in the first place, and it may only end up delaying the inevitable anyway. In the end, despite some in-depth customization, Cruise Ship Tycoon is a pretty shallow tycoon simulator with some really bad technical issues that drag it down. Casual gamers might enjoy it since it doesn’t demand a whole lot of time, but even they might shy away from its confusing and intimidating interface. Gamers should probably just look elsewhere.